The Avissawella road leading up to the Bellair Bungalow makes for a captivating journey. This scenic route is mottled by paddy fields in different shades of lovely green, coconut palms that gently sway with the wind, verdant hills camouflaged with endless rows of rubber trees, all set against a splendidly azure sky. The turn to the estate is marked by a little rivulet that runs all the way beyond the Bungalow. The pathway is fringed by mile upon mile of rubber estate, quaint tea plantations and patches of pineapple shrubs. The rivulet even forms little natural pools to enjoy a cooling dip if desired. 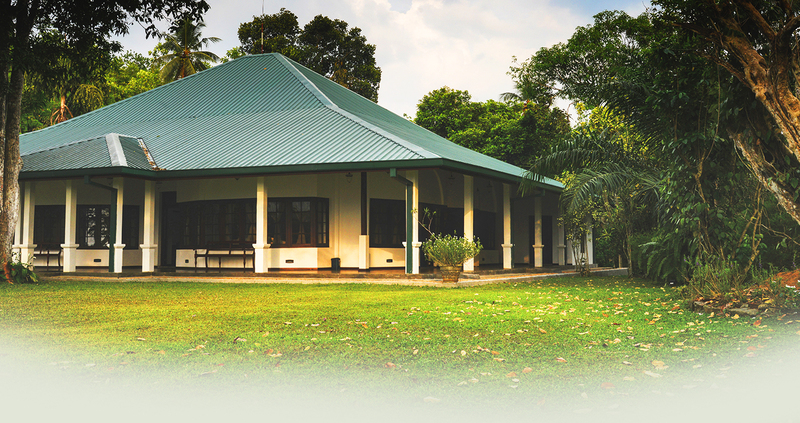 The Bungalow, comfortably able to accommodate 15 people, is a newly refurbished, 120 year old property that sits on 6 acres of charming rubber estate. It has now been restored to resemble its glory days, and yet is equipped with all modern facilities necessary for a hassle free vacation. A neatly kept lawn and pebbled pavement lead to the Colonial style Bungalow surrounded by French windows to afford alluring sights of the garden and estate outdoors. Polished cement floors; spacious, airy rooms; dark teak furniture; large glass windows and antique fittings; all these accentuate an inclination towards traditional interiors. The garden is speckled with rambuttan, laavulu, coconut, jack and enormous fruit bearing mango trees. An occasional coffee plant set against pepper vines that trellis over, and bright green ferns that grow from the bark of palm trees are indeed a welcome sight. Stone benches allow for relaxing under the shade of these trees. 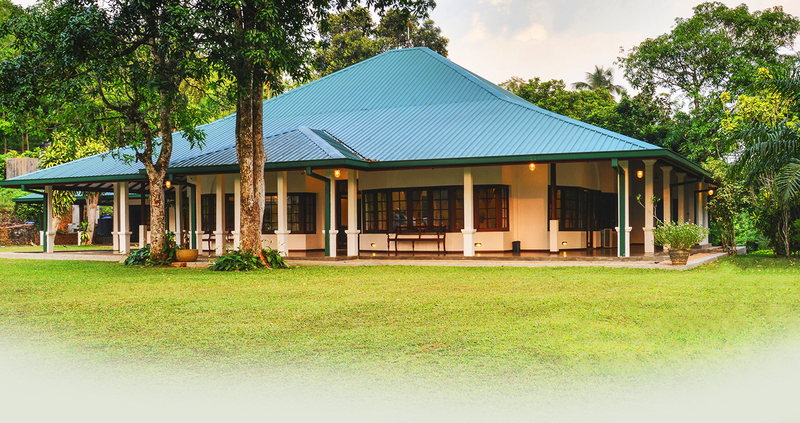 Furnished with comfortable wooden benches, the veranda that runs right around the Bungalow, is just the right spot to engage in some casual chatter, while taking in the views of the estate. Perhaps, the most stunning feature of the Bungalow is its infinity pool in the garden. 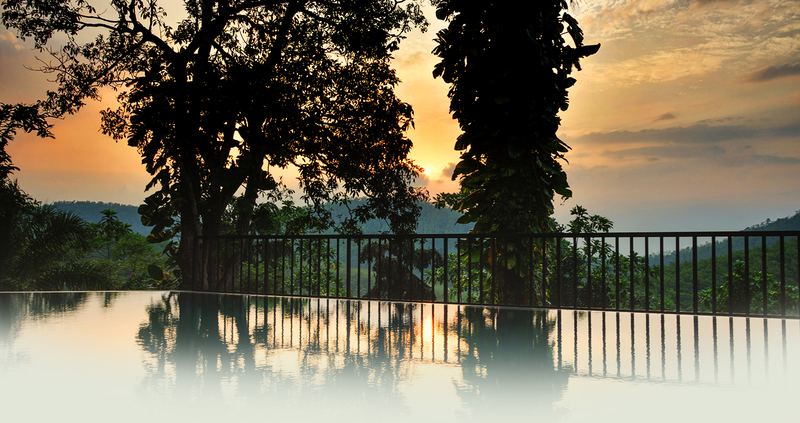 Hemmed in by the trees and overlooking the ‘Kodi Kantha’ mountain range and rubber estate, this pool is the ultimate experience of relaxation, right in the heart of a hillside vacation. Welcome to Ranmin Bellair Bungalow, where tranquility reigns and resplendent beauty prevails.